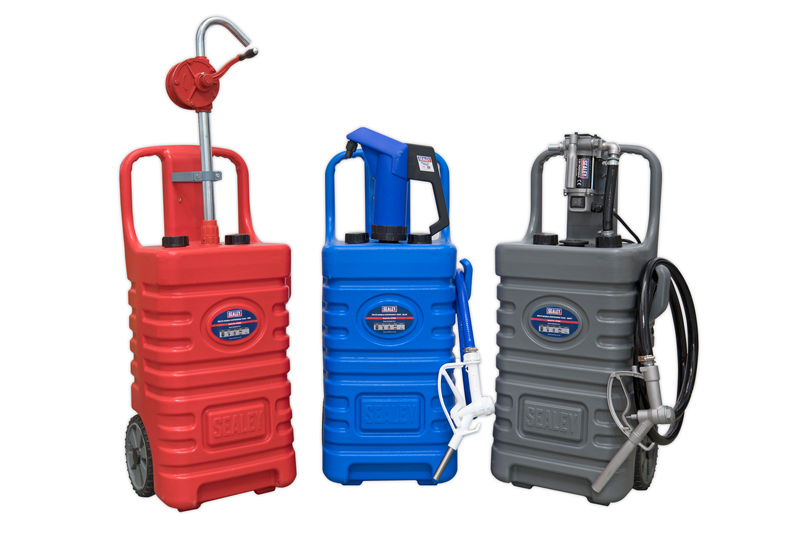 Sealey’s mobile dispensing tanks are manufactured from hard wearing and durable polyethylene. The 55L capacity tanks are suitable for the distribution of diesel, oil, AdBlue, water and antifreeze. They are available in three configurations and colours; Model No. DT55RCOMBO1 (Red) is supplied with Model No. TP55 Oil Rotary Pump, DT55GCOMBO1 (Grey) is supplied with Model No. TP96 12V Diesel Pump Kit, and DT55BCOMBO1 (Blue) is supplied with Model No. TP6607 AdBlue Lever Pump. The units are fitted with two roller wheels, a hose holder and vent caps. Each tank features a 2″BSP thread and four point screw fitting which enables other pumps to be fitted as required.